Due to high cost of commercial feeds people now tend to resort to alternative feeds. Some uses leaf-overs from restaurant, fast foods etc. Some feed their animals plants like ipil ipil leaves, camote, duck weed, banana etc. If you have read some article about alternative feeds please post it here for the benefit of everyone. Feeds comprise about 70% of the total cost of swine production. During the review of the FSSRI-BAR project entitled �Improving the Integration of Animal Production in the Upland Farming Systems of Selected Communities in Mt. Banahaw� in December 1999, trials on alternative feeds for swine was suggested by the Officers of the partner farmers organizations. Among the alternative feed ingredients mentioned were cassava (Manihot esculenta) and the corms of Gabing San Fernando (Yautia sp. , Family Araceae) locally known as sakwa. The use of cassava had already been studied as an alternative to corn for feeds. Results of several experiments have proven that the performance of animals given with cassava-based feeds is comparable to those fed with corn based rations. However, its use as feeds was constrained by the availability of the materials. Demand for starch and table consumption are higher, hence the price of raw materials become prohibitive for feeds. On the other hand, sakwa, a by-product of gabi production, is traditionally used as feeds for swine parti-cularly at the finishing stage. The sliced sakwa and gabi leaves are usually given fresh or boiled with feed concentrates. Among other root crops grown in the Philippines, gabi ranks third to sweet potato and cassava in production and hectarage. It is generally grown as a backyard crop. Gabing San Fernando is the Tagalog term for Yautia or Tannia (Common name). This is also referred to as Takudo in Cebuano and Butig in Waray. Gabing San Fernando is a robust slant and generally adapted in the upland condition. It thrives best in deep, loose, friable and sandy loam soil with abundant organic matter and moisture. It is well adapted in plateaus and can withstand even soils dominated by cogon. Although it can be planted anytime of the year it performs best when planted at the start of the rainy season. This crop is resistant to adverse climatic conditions including drought and relatively resistant to pest and diseases. Gabing San Fernando ranks second to sweet potato in terms of nutritive value and digestibility. Sakwa of Gabing San Fernando has a crude protein (7.67%) comparable to that of corn, thus giving it a greater potential use as feed ingredient. It has a more or less spherical shape while the cormels are flask-shaped, usually larger than those of gabi. A preliminary study on the feeding of sakwa-based feed rations to swine fatteners was conducted by the Farming Systems and Soil Resources Institute (FSSRI) in Barangay Pinagdanglayan, Dolores, Quezon under the project supported by the Bureau of Agricultural Research (BAR). Drying of sakwa was tried by air drying, sun drying or through mechanical drier. Air-drying requires at least five days to attain 14% moisture and sun drying, 3 days. Initial trial was also made using the CEAT multi-purpose drier. Chipping of sakwa is done manually or with the use of a mechanical chipper. Manual chipping is slow and laborious with an output of 9-20 kg/hr/person. Slices can either cross-sectional or longitudinal. Longitudinal slices are more advantageous than the cross sectional or oval cuts because they dry faster. Dried chips that are not milled right away are stored in sacks or containers that can be tightly closed to prevent moisture reabsorption. The use of mechanical drier and chipper are potentially economical if operation will be made on a large scale. In the on-farm trial conducted for the utilization of sakwa-based feed ration for swine fattening, dried sakwa was used as a replacement for the corn component of the feeds. Corn was replaced in the ration at 50% for the grower feeds and 75% for the finisher rations. The feed formulation was prepared in cooperation with Luntian Multi-purpose Cooperative, Inc. (LMC). The LMC milled the dried sakwa and mixed with the feed ration. There were three farmer-partners involved in the trial. Each farmer had nine fatteners which were crossbred of Landrace and Yorkshire from the Institute of Animal Science, UPLB. The fatteners were divided into three groups with the first group serving as the control and was fed with commercially available feeds used in the area. The second group was fed with sakwa based-feed starting from growing stage (about 30-35 kg per head) while the last group was fed with sakwa-based feed only during the finishing stage (60 kg above). Results of the trial showed no significant differences on the average daily gain (600 g/day) and final weight (80 kg) among the test animals after four months of fattening. Meat color was comparable while backfat thickness was acceptable for all treatments. However, differrences in the net benefit was observed. Sakwa-based feeds had lower cost compared to corn-based ration. Partial budget analysis showed a higher net benefit in the feeding of sakwa-based feeds to swine starting at the grower stage. Animals fed with sakwa-based rations realized a net benefit of about P 740 per head of swine while those fed with commercial feeds has about P 340 per head. The swine industry dominates other livestock industries in the Philippines in terms of volume and value of production. In 1998, swine population was 10.4 million heads which 17% is in commercial scale and 83 % in backyard farms. One major problem, however, is the rapid increase in price of commercial feeds and feed ingredients which comprice 70 to 75 percent of the total production costs. Golden apple snail (Pomacea caniculata), commonly known as golden kuhol, is a major pest of rice. However, its meat is a good source of protein for swine. Research results showed that fresh golden snail meat could replace 10 percent commercial mash for growing-finishing pigs or 37.5 and 60 percent soybean oil meal in formulated grower and finisher rations, respectively. 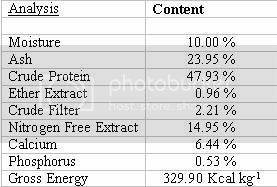 Nutrient Composition Shown below is the proximate analysis of fresh golden snail meat (FGSM) on an air dry basis. Below is the recommended mixture of FGSM and commercial mash that should be fed to the animals daily as a function of their age. 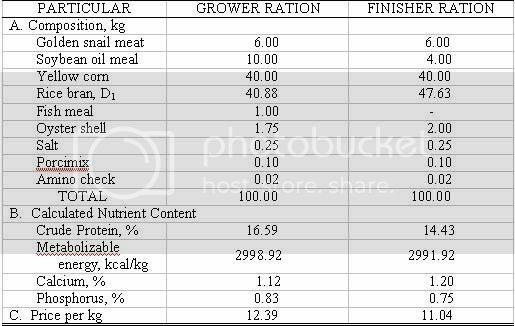 Below are the composition, nutrient content and cost of formulated grower and finisher rations with FGSM. 4. Separate the FGSM from the shells. 6. 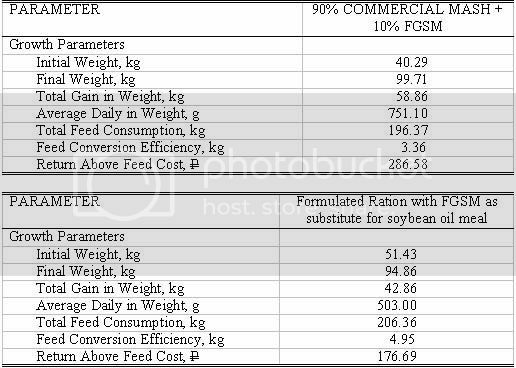 Mix the FGSM with commercial mash (as replacement) or as substitute of soybean oil meal in the formulated ration following the level described above. 2. Increases the income of animal raisers in golden snail infected areas. Doc,it has been my experience in the Philippines that no one will give up their trade secret(s),anyone who has a winning formulation will keep it to themselves,fair enough.I will say avacados work well it has some sort of oil in it,our hogs love them,fed to the breeding stock only.Protein is the main ingredient that cost the most,if you are going to feed your hogs snails,might as well feed them dried poultry manure as well. hey mikey you are so right no hog farmer will give away any winning secrets for free. Trade secret cost money, and also it will earn you some money. So, most of alternative feeds, formula comes from the academe. And we can learn from it and create our own from it. Avocado have high cholesterol content so to be safe don't feed it to the finisher animal. Some say cholesterol of avocado is safe for the heart but some say it is not. so just to be safe do not include it in the finisher pig diet. Hey doc can you find us the trade secret?A private pm would be ok I could cut you in the action.I sure would like to know because I have like 45 piglets and not sure what to do sell them or do fatting? Doc,I think if the feed tags listing ingredients was posted here first,we might be able to pick it apart and brainstorm up with a formula,it has been my experience that getting the starters going is very difficult with a homemade formula.The fatteners seem to do better with the homemade formulations,yes you are right,restaurant scraps and bakery scraps and vegetable scraps from the market, cooked first ,has been used for many years here in N.America by people growing a few hogs for personal use.Hog farmers here are having a hard time with production costs as well.The problem with raising high producing animals is that they require high quality feeds to make them produce well. There are several methods of alternative feeds,besides bagged hog chow.I have tried experimenting before with starters but they got diarrhea and died.Mixing ones own feeds might be more practical,some may be able to grown corn and other crops on their land,was wondering if one can feed silage to hogs,if it was cooked with the other ingredients first would add some uplift to the hogs,think this time would give them medication with the feeds for the first 3 days to help elimate diarrhea,after 3 days they may or may not be accustomed to the new feeds?? ?always the million dollar question. The hard part is to put it all together and make it work for your management practices. sweetpotato is a valuable pig feed,roots provide energy and the leaves protein,feed fermented into silage (14-30 days fermentation period to make the silage),sweetpotato root/vines,corn meal,cassava meal,rice bran,sun dried chicken manure. the bigger the hog,the lower percentage of protein,and a higher percentage of starch. the bigger the hog,the more ration kg. of feed per day.I think after the 2nd month when you drop the protein % you add more starch food like,corn meal,cassava leaves and rice bran. Doc,if one did not want to use dried chicken manure,urea is a chemical source of protein,how much would one use in this formulation?? Silage was used because it is less labour intensive. Doc, how can we put this all together to make sense of it,what would it take to make 50 kg.-100 kg. with 30%,20% 10% DM. no % was given or DM content was given. If not urea,then was thinking about Moringa tree also known as Mothers Best Friend or Malunggay,contains alot of vitamins and minerals,50 grams of dried leaf powder contains approx, 21% protein.I know care must be taken to avoid excessive protein intake.Too much protein in hog feed will increase muscle development at the expense of fat production.Would it be better to add this in powder form,just before the feeding and how much would one mix into lets say 50kg. mix and 100kg. mix. I am getting closer to solving this problem,need the proper %,kg. and DM content to complete the problem,not that familar with nutritional values. If i found one i'll just post it here. I think silagin is not feasible for swine. THe counterpart of it in swine is called fermentation and unlike silaging you can't store it for a long time. sugar cane c molasses%DM type A cp-34.9,ash-4.1,cf-0.5,ee-0.2,type b cp-37.0.ash-5.5,cf-0.7,ee-0. If you have this thing you will just need another protein source and i think you could create a formula for your swine. Sugarcane juice is an effective corn replacement and energy feed for swine. Extruded mixture of sweet potato and copra are good partial direct corn replacement while fresh tomato pomace or FTP are effective feed for growing and fattening pigs. Growing-finishing pigs fed with sugarcane juice-based ration showed good performance and efficiency in terms of average daily gain and total live-weight gain. Carcass evaluation of pigs fed with sugarcane-based diets also showed better dressing percentage, lesser back-fat thickness, firm fat, and leaner muscle tissue than those fed with commercial feeds. Sows fed with sugarcane juice-based ration showed high conception rate, good litter size at birth, and furrowing index compared to pigs fed with commercial diet. Extruded mixture of copra (30 percent) and sweet potato (70 percent) partially replaced 20-30 percent of corn in the ration. Mineral analysis of the extrusion showed the presence of calcium and phosphorus that can replace up to 30 percent of corn in the grower diets without significant depression in feed intake, live weight gain, and feed efficiency. Fresh tomato pomace produced from processing of tomato into tomato paste, on the other hand, contains crude protein, crude fat, crude fiber, nitrogen-free extract, and calcium phosphorus. Studies showed that 35 percent of fresh tomato paste fed as substitute for commercial mash in the finishing pigs resulted in significantly higher final weight, total gain weight, daily gain weight and feed consumption than those fed with commercial feeds. Feed cost per kilogram gain significantly decreased with increasing levels in FTP use. Growing pigs fed with FTP had final total weight gain, average daily gain, and feed efficiency comparable to those pigs fed with 100 percent commercial feeds. Feeding six percent of FTP significantly increased feed consumption yet reduced feed cost per kilogram gain. With these agricultural feed substitutes, ensuring swine productivity at minimal cost will surely be beneficial to the country's swine raisers. i give malunggay for my pigs, dami dito kse. you'll be surprise kung gaano karami ang vitamins na nakukuha mula rito. i also give kamoteng baging and kamoteng kahoy leaves. yun bang gabing san fernando e yung may malalaking dahon na halos kalahati ng payong ang lapad? Dapat pala nag search din me picture. oo nga doc, mas maganda me picture.